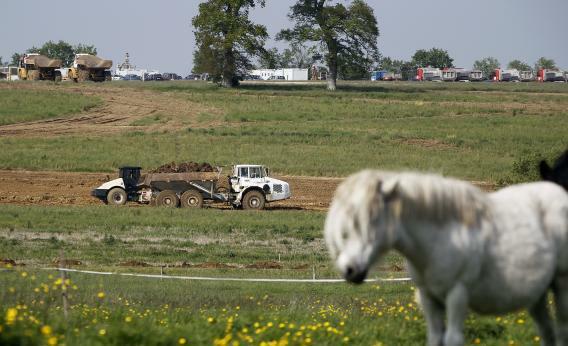 Trucks build a waste center near the worldwide famous stud farm ‘Haras du Pin’ on May 23, 2012 in Nonant-le-Pin, western France. Speaking with Fareed Zakaria, Kansas Secretary of State Kris Kobach argues for severe curbs on immigration and in the process ends up revealing a pretty shocking level of ignorance about the agricultural economy for a Kansas politician. Adam Ozimek shows that Kobach seems completely unaware of the extent to which the American farm sector is operating in an international context. But I think Kobach’s fundamental problem—as is often the case—is a failure to recognize that there are different factors of production and they complement each other. A farm is a place where labor, machines, fertilizer, and land all come together to produce some grains, fruit, or vegetables. To simply assume that if you cut off the supply of cheap immigrant labor will raise wages ignores the very real possibility that simply less land will be cultivated. Even if you ignore the international dimensions of the issue, Americans don’t have a fixed totally price-insensitive appetite for foodstuffs. If you restrict the supply of agricultural labor you’ll have less agricultural output and fewer acres in cultivation. The problem gets really bad when you consider the other factors of production. Farms use machinery and fertilizer and the output is moved by truck and by train. All those capital goods, however, are in part made up of human labor. Fewer farm workers means less agricultural output means fewer jobs building farm equipment. And in the service economy, fewer immigrant busboys means fewer job opportunities for chefs and manufacturers of kitchen equipment. No factor of production is an island, and creating scarcities of one factor damages the others.